Gosh, it really is a buyer's market these days as Neal Esterly at Fraser Yachts sends news of another price reduction on his central listing, the 30.48m motor yacht Keiki Kai. Built by Benetti in 2005 to Lloyds class and with an exterior by Stefano Righini and interior by François Zuretti, she sleeps eight guests in a master, VIP and two twin staterooms. This superyacht has an innovative six deck layout usually found in much larger yachts and her twin 1400hp Caterpillar engines give a cruising speed of 14 knots and a range of 2,100 nautical miles at 10 knots. Keiki Kai is fresh from a major refit including complete new exterior paint and Lloyds certification renewed, ready to be enjoyed by her new owner. 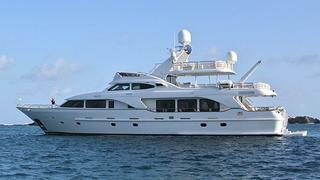 Available to view at the Fort Lauderdale show, her asking price is now down from $6.25 million to $5.95 million.